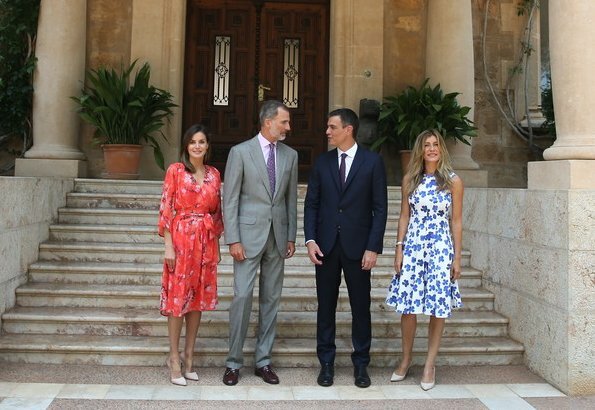 Letizia looks beautiful, dress, hair, shoes, jewelry and make up are perfect. I also like Begonas dress, but her hair is a mess. Both ladies dresses are very summery and appropriate. The men look good too. I've thought the same. Why did Senora Gomez Fernandez not brush her hair? Agree. Red is always such a becoming color to Letizia. Letizia looks nice, love her dresss and her make-up. Precioso vestido de Leticia. Me encanta con estampados florales. Perfect as usual! Love the dress! I loved Maria's dress and Letizia's dress is beautiful too. Both these dresses are bright, flowy, appropriate, colorful, and will hopefully keep the ladies cool. Ms Begoña desperately needs to get her hair tamed, it's very messy. Long hanging hair and center parts don't work on everyone even though it's the style nowadays. Mr. Sánchez should make sure his tie is straight; so many men have that problem. I love both dresses, shoes and accessories. Lovely. I agree about the hair being in need of a brushing. All four are perfectly attired. Both dresses are just lovely and appropriate for the summer. But when you look at this photo what jumps out is Maria’s hair. Both women are beautifully dresses. I am sure we all know Maria's hair style is deliberate, whether we like it or not. I am agree with what has been told. Plus, I think Begoña's dress is much more matched with white white shoes than the model's red ones. 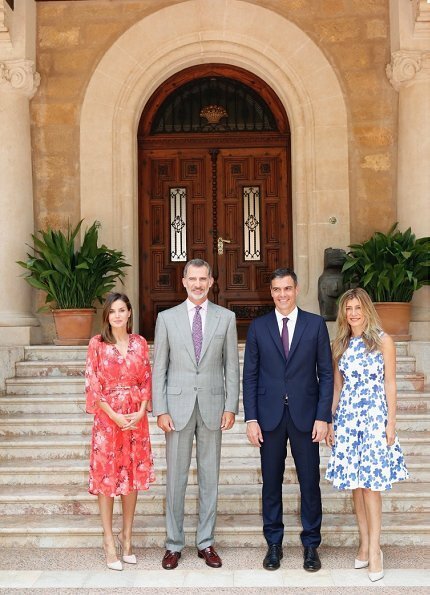 King Felipe is a fine example of how a man should (always) wear his suits: perfectly measured, proper material, room for movements, perfect lengths, and precise tailoring. I totally agree. 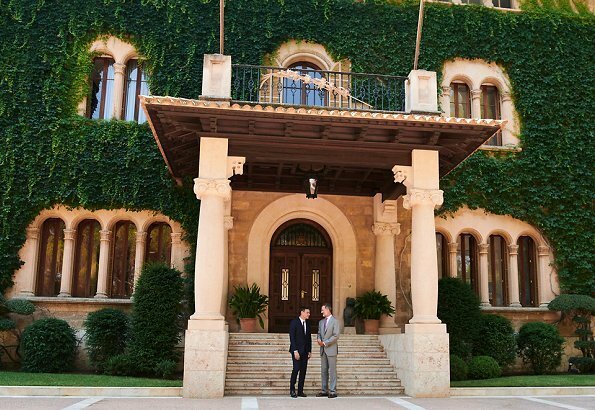 Felipe is always dressed impeccably, and I enjoy seeing men who get it right. I think that Felipe, along with King Carl-Gustaf and Prince Charles are the best dressed royal men, by a large margin. Most of the others often look sloppy with poorly tailored suits. And it´s not rocket science to make a suit fit its wearer. Bonita foto, los 4 se ven muy bien y dan buena imagen. La Reina está muy bella, serena, con ese peinado y maquillaje suave. Curiosamente, Begoña y Letizia se ven mejor conjuntadas que las modelos. La esposa del presidente no es guapa, pero tiene muy buena figura. Esperemos que la próxima vez se peine mejor. Expensive dress for the wife of a socialist politician. No lo creo. Ese vestido está muy rebajado actualmente y es muy buen detalle que se haya vestido lo mejor posible para su primera visita a SSMM los Reyes. I think both ladies look lovely in their summer dresses and the gentlemen very smart. I agree that the hairstyle is a choice and not a lack of brushing, I personally think that it destroys the entire ensemble. 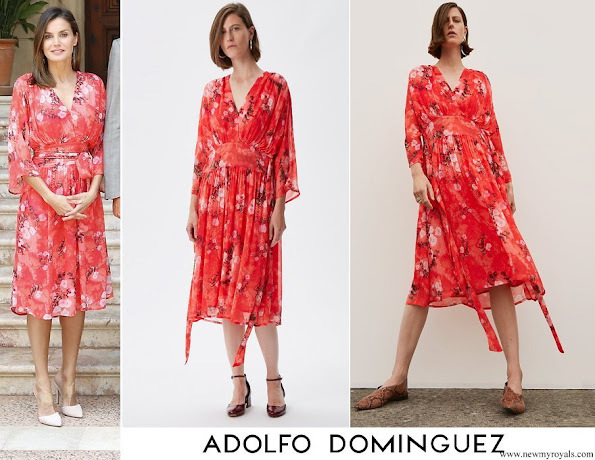 ****Heather, the dress can be bought by 230€ in one of the "big stores" in Madrid, I don't think is too outrageous for anybody regardless of their party afiliation. I see "Carolina Herrera" and I think $$$. For that price I'd buy it too! 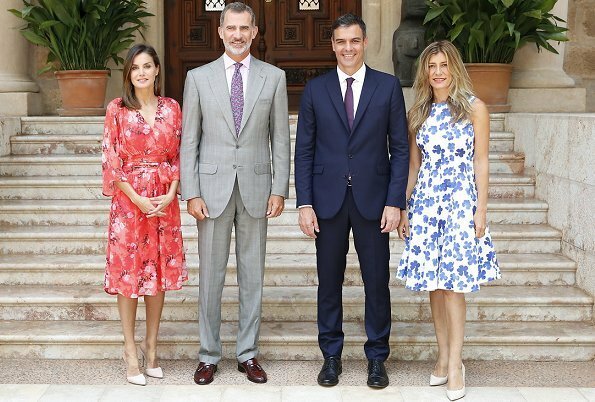 El rey Felipe como siempre ejemplo de elegancia y clase. Uno de los royals masculinos mejor vestido, y el más guapo. Los reyes fueron al cine con las niñas, y Felipe llevsndo a Leonor de la mano! Once again - perfection !